Cauliflower recipes are generally quick as cauliflower cooks fast. 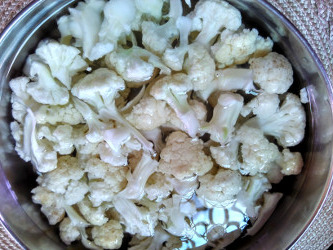 Cauliflower is known as phoolgobi / gobhi(Hindi), hookosu (Kannada) in Indian languages. 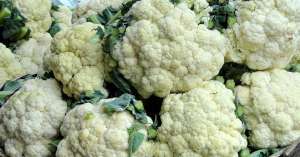 Cauliflower can be cooked by itself combined with many other vegetables, rice and flours too. It is a winter vegetable and you can see the street vendors with carts filled with cauliflowers and tomatoes on the street. Cauliflower or gobi manchurian in a popular street food. Cleaning cauliflower before cooking is a must as it may contain dirt as well as small insects/worms. Just washing it under running water is not enough. Alphabetical list of vegetables - Vegetables list with English names.